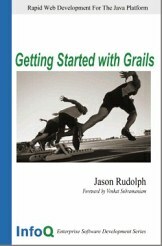 In this lastest InfoQ book, author Jason Rudolph introduces Grails, an open-source, rapid web application development framework that provides a super-productive full-stack programming model based on the Groovy scripting language and built on top of Spring, Hibernate, and other standard Java frameworks. Over the course of this book, the reader will explore the various aspects of Grails and also experience Grails by building a Grails app. The book also comes with source code for each chapter. The author of the book, Jason Rudolph, also wrote the article Grails + EJB Domain Models Step-by-Step which was one of InfoQ's top 5 Java articles in 2006. You can find Jason online at http://jasonrudolph.com. See also InfoQ's Grails mini-portal at: http://infoq.com/grails. Hey guys, great job on the mini-book! Yet another fantastic resource for upcoming Grails developers to call on. Excellent work. Jason Rudolph! Thank you!!! Greate job!! !